Heavy Metal is a world-renowned work that brings together the best of science-fiction, fantasy and horror. Now, the magazine is working with comiXology and Amazon on a new distribution agreement to sell the book on comiXology and the Kindle Store. The debut includes Interceptor by Donny Cates and Dylan Burnett, Narcopolis and Heavy Metal #280. February 3rd, 2015 — New York, NY— Heavy Metal, comiXology and Amazon announced today a distribution agreement to sell Heavy Metal’s fan-favorite science fiction, fantasy and horror digital comics and magazine across the comiXology platform as well as Amazon’s Kindle Store. Today’s debut sees the addition of the acclaimed science fiction and fantasy anthology, as well as two new original comic series on both comiXology and the Kindle Store. 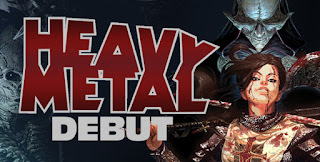 Heavy Metal is an American science fiction and fantasy comics magazine, known primarily for its blend of dark fantasy/science fiction and erotica. The fourth oldest American comics publisher at nearly 40 years of age, some of the greatest European and American comic book writers and artists in history have appeared in the pages of Heavy Metal. Since the magazine’s inception in 1977, the Heavy Metal banner has been seen in video games, television, and a 1981 animated feature film. In 2015 the brand established it’s first-ever line of traditional monthly American comics. ComiXology, an Amazon.com, Inc. subsidiary (NASDAQ:AMZN), has revolutionized the comic book and graphic novel industry by delivering a cloud-based digital comics platform that makes discovering, buying and reading comics more fun than ever before. ComiXology's Guided View reading technology transforms the comic book medium into an immersive and cinematic experience, helping comiXology become a top ten grossing iPad app in 2011 and 2012 and the top grossing non-game iPad app in 2012 and 2013. Offering the broadest library of comic book content from over 75 publishers - and independent creators as well - comiXology will not stop until everyone on the face of the planet has become a comic book fan. ComiXology is based in New York City, with operations in Seattle, Los Angeles and Paris. For more information visit www.comixology.com.